For months conservative and right-leaning websites have been complaining that all the social media giants — Google, Facebook, YouTube and Twitter — have been downgrading, banning, or otherwise censoring their content. For just as long the social media behemoths have been denying it’s happening, despite research and evidence that says otherwise. Now, a class-action lawsuit filed by former Google employee James Damore claims that a senior engineer at the company pressured officials to sabotage President Donald J. Trump’s Android phone. In addition, Altman — who still works for Google — called on her company to blacklist “alt-right” sites on Google’s advertising network while taking down “Alt-right videos” from YouTube, which the company owns. And she called on the company to remove “neo-Nazi sites such as ‘The Daily Stormer’” from Google’s massive search index. 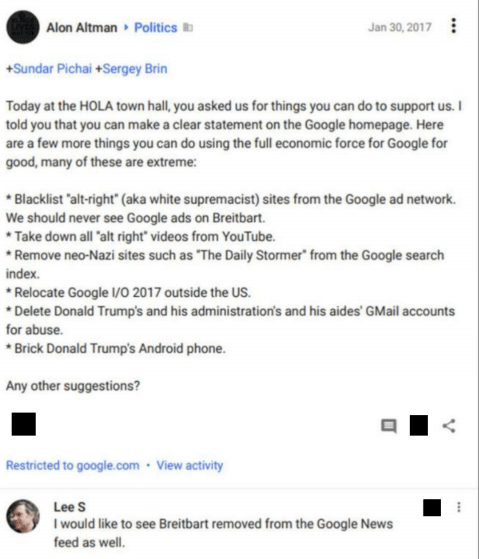 It appears as though Google took one of the senior engineer’s suggestions; The Daily Stormer was essentially booted off the Internet in August 2017, a decision that was even condemned by the Electronic Freedom Foundation (EFF), which leans to the political Left. Breitbart News reported that Google has yet to take Altman up on her suggestion to remove it from Google Ads. But the company’s employees have started to advise Google Ad clients to stay off the Breitbart network, the news site reported earlier this year. In recent months both YouTube and Google have attacked Natural News and its founder/editor, Mike Adams, the Health Ranger, first by targeting the site itself and then by banning his channel. First, Google blacklisted all Natural News stories from its search engine, which is the cyber-equivalent of Internet banishment considering that Google drives 75-80 percent of all search traffic for most websites. Next, without warning, YouTube took down Adams’ channel, blocking access to hundreds of educational and self-help videos before eventually restoring it weeks later. Both actions were arbitrary and not based on either platforms’ community standards. Someone at both companies simply didn’t like what Adams or Natural News had to say, so they just removed or blocked their content, perhaps on the suggestion of someone like Altman. As for Damore’s lawsuit, he presented more evidence that Google’s ad departments are attempting to undermine revenue that many conservative sites depend on to remain afloat. The suit says that when Google’s “Large Customer Sales” (LCS) team learned that the Canada-based conservative news site The Rebel Media was targeted by the far-Left group Sleeping Giants, they used it as an excuse to advise all their clients to withhold advertising placements on conservative sites. In a form-template email to the company’s ad clients, Marshall Self, the Director of Agency at Google, advised clients to take part in the tech firm’s “wide number of controls, including placement exclusions and filters for political content” in order to keep their ads from appearing on certain sites, apps, videos and YouTube channels. There is little doubt anymore that the tech companies are indeed banning or attempting to revenue-starve any politics or culture site that doesn’t adhere to the Marxist Left. The only question now is whether anyone will ever get any relief from the courts. Don’t miss out on the really important news — bookmark Censored.news and check it all day, every day. Also, stay tuned for the launch of Real.video.